Early in the evening we meet at the crossing of Yekaterininskaya and Deribasovskaya. Vlad arrives with his girlfriend. He is dressed like a typical resident of a leisurely southern town, wearing shorts and slippers. We sit down at a café and drink tea. Vlad recounts. He is quite well-known in the city. A long time ago, he was one of the leaders of the Communist Youth of the official Communist Party. Then he left them for the more radical “Borotba”. 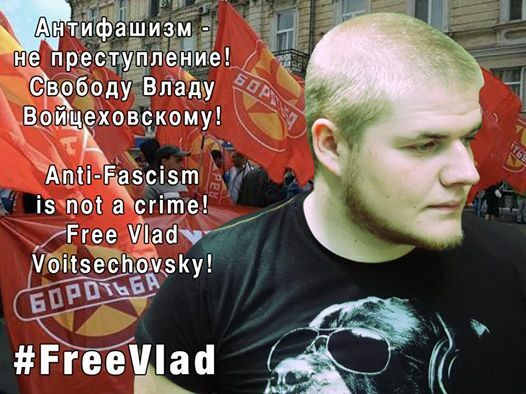 He was one of the organisers of Odessa’s Anti-Maidan and the opposition camp at the Kulikovo Field. On May 2 he was in the Trade Union House. He suffered burns, but was able to escape through a window and rescue several people from the burning building. 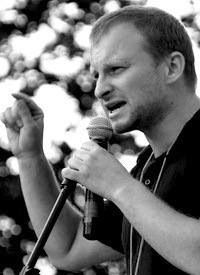 There is a video recording of him, Alexei Albu and other activists being beaten up and forced to kiss the Ukrainian flag. Afterwards they were taken away by police. Some time after the tragedy, Vlad was arrested. He spent several weeks in jail before being released. All summer he kept receiving conscription notices – the authorities tried sending him to war. “I called the conscription commissar and explained my position, I said that I will not shoot at my brothers” – he says. Finally, they left him alone. “Why, – I ask a stupid journalistic question, – did the opposition in Odessa reduce its activity?” Vlad patiently explains that the opposition has been crushed. Many of its leaders and activists have been either killed, arrested or forced to flee the country. Part of its supporters are frightened. Others think that after May 2 peaceful demonstrations have become pointless. I ask him whether he considers it a mistake that in spring the opposition was not able to take more radical measures, such as occupations of administrative buildings. “We did not want to drown the city in blood,” – he shrugs. We are sat in a relatively busy café. Vlad loudly tells me about himself, curses the authorities and their supporters. I ask if he is not afraid to talk about this in public. “What will they do to me?” – he replies to my question with another question. “This is my city,” – his girlfriend says, – “why should I stay silent?” Their political opponents often use the argument that if one does not like the new Ukraine, they should move to Russia. But these folk consider themselves Odessites. Where should they go? Vlad suggests that we go see Odessa’s Lenin statue, which was taken off its plinth at Kulikovo Field some years ago already and moved to some park at the city’s outskirts. We go to his car. It is a rusty old “Lada” which, to my surprise, still functions. We drive through the city for a long time until we reach a square where the proletarian leader now stands, reaching out his hand. The statue is all splattered with paint, and has swastikas and writings scribbled all over it by those who still cannot sleep calmly at night because of the stone Ilyich. We smoke silently. Pensioners with their grandchildren stroll through the park. One of them greets Vlad and his girlfriend and shakes their hands. The evening is approaching, and soon our train leaves for Kharkov, and the guys give us a lift to the station. I wish them peace as my farewell. “That’s what we’d like too” – they reply somewhat uncertainly and drearily. That same night, while I was asleep in my train carriage, Vlad was arrested. The next morning, the second from the top news item on Ukrainian “Yandex” [search engine and news website] was headed “SBU prevented a series of terrorist attacks in Odessa”. Now Vlad faces 8 to 15 years of imprisonment. For storage of explosives and sabotage. It is reported that a search of his flat revealed ample evidence. Vlad’s girlfriend tells me that during the search, the police was assisted by “civil activists”. Quite possibly, those same “civil activists” who took part in the May 2 pogrom. According to her, they were the ones who brought the material evidence to the flat. Vlad was beaten with iron rods during the arrest. They demanded that he testifies against himself and his comrades from “Borotba”, most of whom are already in emigration anyway. I find it strange that a person who is plotting to blow up the SBU spends half a day with a journalist, loudly proclaims his oppositionist views in a café, and leads trips to the statue of Lenin. I do not, however, find it strange that in Odessa the witnesses at the search of an opposition activist’s flat are the same people who beat him four months ago during the Trade Union House massacre. Many Maidan supporters told us during interviews that they do not want compromise, and that the path to peace in the country lays only though their complete victory. In this, they are consistent. It might be that these people think that they are consolidating their power in the city. They probably think that they are struggling for peace in Ukraine. But I think they are badly mistaken. Regarding both peace and victory. P.S. In Ukraine I was often asked whether I was Kremlin’s propaganda. Take a look at my biography and you will see that I hardly fit this role. I was and remain an adversary of the Putin regime. But does this change anything in the story I told? Or perhaps someone thinks that I ought to have kept silent about this “in the name of common interests”? This entry was posted in Solidarity and tagged Borotba, massacre, may 2, Odessa, political prisoners, sakhnin, Ukraine, Vlad Wojciechowski. Bookmark the permalink.